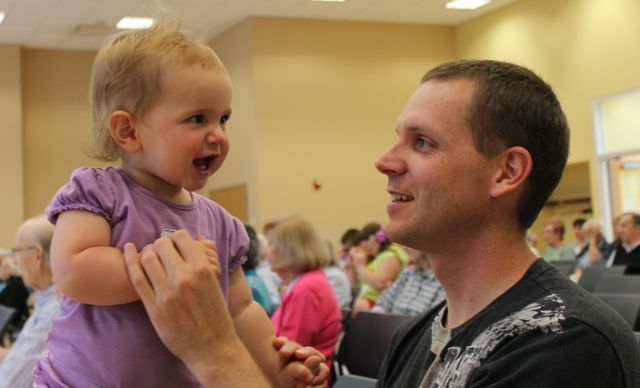 Last week, I attended the Mazza Museum Summer Conference in Findlay, Ohio. 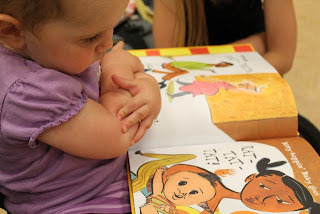 It was a week filled with eleven keynote presentations by award winning authors and illustrators, children's writing classes, book signings, and quality time spent with people that love children's picture books as much as I do. I couldn't have asked for a better experience. At the end of the week, conference attendees were asked to reflect upon the week and complete an exit survey. I gave the conference high marks in all areas. At the bottom of the survey, there was a space to suggest artists, illustrators, and authors that should be considered as presenters for future conferences. I remembered earlier that we were told that the conference committee strives to bring only the best-of-the-best to their conferences. So, as I sat in my hotel room, I thought about all the illustrators whose work I have encountered over the past 8 years of reading to my children. I pretended to be a member of the conference committee; jotting down names, thinking a bit more about who I would love to hear speak, evaluating possible choices. I came up with a list of illustrators whose work has made an impression on our family. One of the names I wrote down was R. Gregory Christie. The accomplishments of R. Gregory Christie throughout his career as an artist and children's book illustrator clearly make him one of the best-of-the-best. Christie said, "Being an artist was a path in life I chose very early on, but children's books as a career came as surprise to me." (Illustration Friday, Yuko Shimizu). His big break came from an "experiment" to bring his art to his favorite night club through slide shows and live art demonstrations. His experiment was well received and landed him a few opportunities to create art for album covers. The cover for the single Summer in the City by Justice System "caught the eye of an editor" at Lee and Low Books. (Seven Impossible Things). Shortly thereafter, he illustrated his first book, The Palm of My Heart, which was awarded his first of three Coretta Scott King Honor Awards for Illustration (1997). Thus far in his career, Christie has illustrated over 40 books including many historical and biographical books including Only Passing Through: The Story of Sojourner Truth by Anne Rockwell and Bad News for Outlaws: The Remarkable Life of Bass Reeves by Vaunda Micheaux Nelson. "I choose to illustrate manuscripts that shed light upon historical figures and give a sense of dignity to the many cultures on this planet." (Lancaster Online). Christie's latest and very exciting venture is the opening of GAS ART GIFTS, a bookstore and art studio. 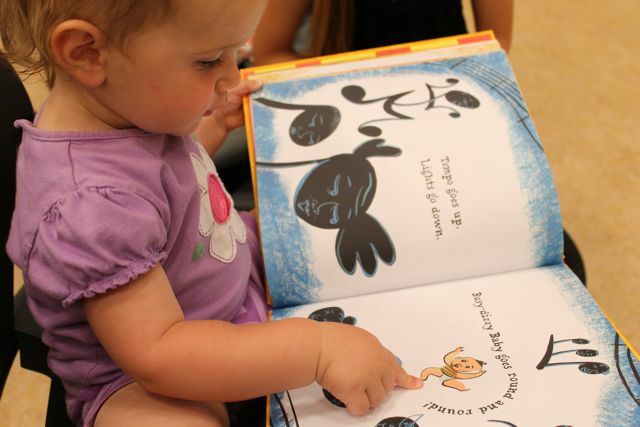 Christie hopes to "foster literacy and a love for tangible arts" by creating a "space where art appreciation and creation intersect" (GAS Arts and INtown). His shop offers an opportunity to purchase his art and books directly from him. He also offers "Drop In and Draw" that invites children to stop by during store hours to create art and "Weekend Art Sessions" for only $5! (Facebook). What a great opportunity for those in the Decatur, Georgia area! I know what my family will want to do if we ever travel south! "No unfortunately it's just a mystery of the past..I wasn't born at midnight, wasn't switched at birth or anything as interesting as that..just a weird quirk from my family members. But, I do remember being a teenager and being called down to the high school office to be admonished whether or not I knew my birth date? I replied "July 27" and the secretary snapped, "No it isn't! Look at your birth certificate". Embarrassed and shocked by the proof, after school was done, I was eager for the evening to come so that I could ask my mom all about it. I was expecting an artist was born as lightning struck at 11:59 and the power went out type of story (like Picasso and his still born tale)..but was let down with a shoulder shrug and a simultaneous "they made a mistake". Although I can only imagine that she was there and would know better than me..to this day I'm not sure what that is all about, so I go by my birth certificate ever since high school. 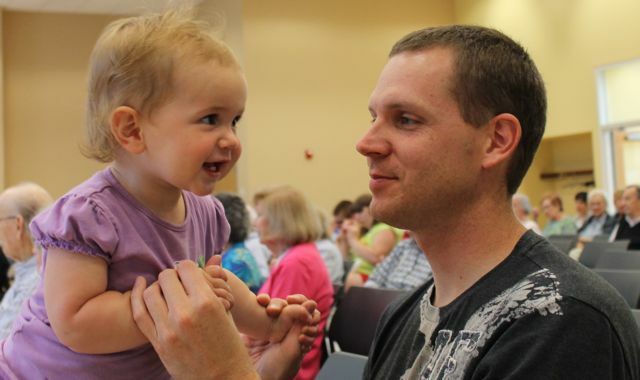 Thank you Gregory for sharing this story with us! 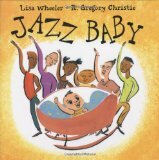 One my favorite books to read aloud is Jazz Baby by Lisa Wheeler, illustrated by R. Gregory Christie. I had read it to all of my children many times except my youngest daughter who is now 16 months old. 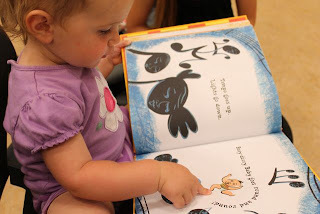 The words of this book are full of rhythm and the illustrations are full of movement. It is impossible sit still and stay quiet when you read this book. I wanted this book to be the focus of our birthday celebration activity, but I was nervous if what I had in mind was going to work out. I wanted to take the family to a jazz concert. 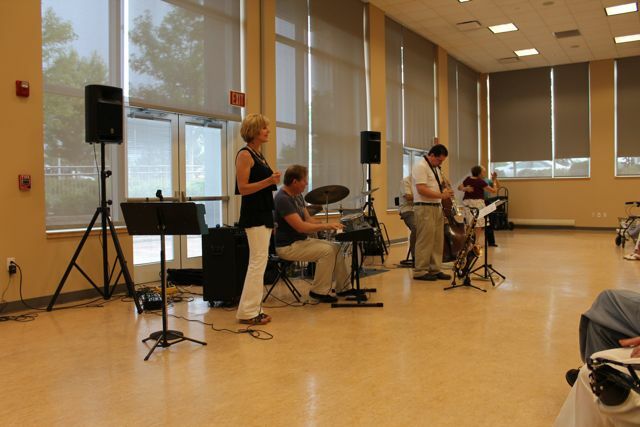 The problem wasn't the lack of jazz concerts available in our area because there were many to choose from. The problem was that all of them seemed to be scheduled for days we already had plans; Mazza Museum Summer Conference, family birthday parties, etc. Thankfully, I found a summer concert series in Beachwood, Ohio featuring the Northcoast Jazz Collective Quintet that we would be able to attend. The only downfall was that my oldest son was busy with Safety Town and had to miss the outing with us. I have been known to get lost when traveling to new places even with printed directions and a GPS. Amazingly, I only had to turn around once and we arrived early to the show. The weather forecast called for rain, so the concert was moved inside. No problem. 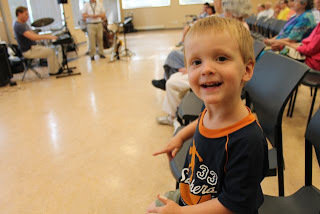 I was super excited to see how my young children would enjoy the live music. 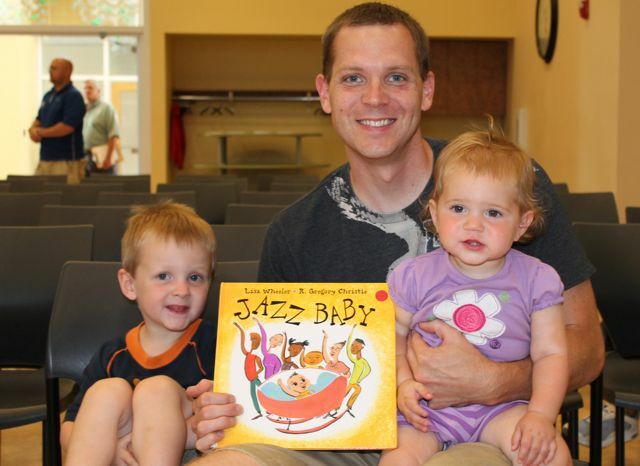 Before the concert we had time to reread Jazz Baby and for my oldest daughter to snap a picture. My youngest son was moving in his seat as soon as the music started. 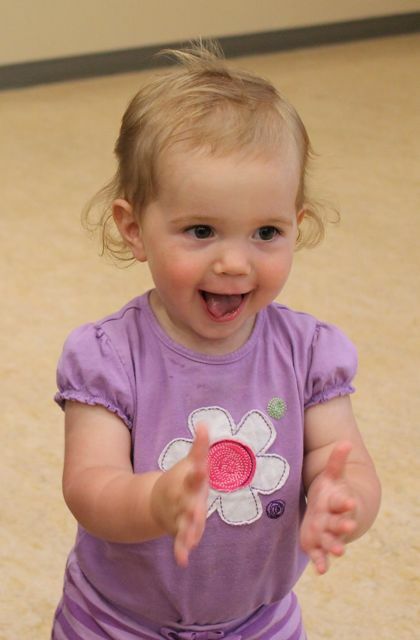 Then, my own Jazz Baby started dancing and entertained those sitting nearby. I am pretty sure I will remember this moment, dancing with her, for long time! This "bouncin' baby bebops with a CLAP-CLAP-CLAP!" 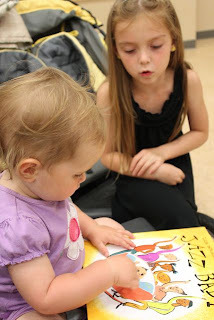 She found the book in the middle of the concert and looked for the Jazz Baby on each page. In this photo she is signing "baby" to her older sister. Hey, look! There is that "busy-dizzy Baby going round and round." Thank you to Northcoast Jazz Collective Quintet for this memorable evening! Below is a video of my two little ones jamming to the music! Gregory, we hope you have a wonderful birthday! Thank for sharing your birthday story with us, for creating picture books we love to read, and for advocating for art and literacy in your community!